The feature film for the closing gala of the 29th annual festival was Handsome Devil, a coming of age romantic comedy set in Ireland. With the theatre filled with an electric energy for closing night, this was an event that was not to be missed. Ned, a red-haired, lanky, loner, is sent to boarding school when his recently remarried father moves to Dubai with his new young flame. With the school run by rugby enthusiasts, Ned is ostracized and bullied for not falling into the passion for the sport like the rest of his classmates. When Conor, his new flatmate in the dormitory, becomes the leading player on the rugby team, Ned literally builds a wall to separate their room. As these two crumble their differences, so does the wall. The rugby team isn’t pleased with the budding friendship between the all-star athlete and the artsy outcast and with a championship match on the line, all parties involved have something to lose! This was a fun and light movie to see, with embedded themes of bullying, inclusion and self-denial at play. The acting was humorous based on the writing, although there were a few jokes that I found a bit contrived. The cinematography showing the landscapes of Ireland was beautiful and helped draw in the audience. Great way to end the festival as we gear up to next year’s 30th celebration! FREE CeCe! tells the story of Chrishaun Reed, “CeCe” McDonald, a transgendered woman of colour, who was brutally attacked in the street. When she defended herself, she killed her attacker. This seemingly cut and dry hate crime against her landed her in jail for murder surrounding heavy gender and racial biases. An unjust ruling declared a nationwide uproar of support, with protests uprooting from the LGBTQ community to free CeCe! This documentary explores themes of hatred, racism, gender, and fear, which are all too timely with the current horrific riots ensuing in the US. Based on the audience’s reactions, I could tell they were rooting for CeCe, pleased with her resilience and uplifting spirit, despite how many opposing parties attempted to demonize her. This documentary explores a dark topic but lines it with colour that is shown through the cinematography, switching between black and white and colour cinematography. The close-ups in the interviews captured CeCe’s family and friends’ raw emotions while she was imprisoned. The soundtrack nicely balanced the tone by uplifting it in inspiring moments. This documentary sends a powerful message about acceptance; important during this current shaky period of inequality. Definitely worth checking it out! Dates and Venues August 12 and 13, 2017 | SFU’s Goldcorp Centre for the Arts, 149 West Hastings St. & Cineplex Odeon International Village Cinema, 88 West Pender St.
Signature Move is an indie romantic comedy that follows the early adulthood of Zaynab, a second-generation Pakistani woman living in Chicago. An immigration lawyer by day, Zaynab spends her nights taking care of her elderly mother who won’t venture outside the home. Peering out the window, her mother’s mission in life is to find Mr. Right passing by for her daughter. If only she knew Zahnab has just found Mrs. Right. The cinematography and the soundtrack were very well done as they truly recreated the feel of the vibrant ethnic pockets developing in our urban cities, whether it’s little Italy or Chinatown. The acting was light and heavy in all the right places. It was a special treat that Fawzia Mirza, co-writer who played the role of Zaynab, was at the screening, where she opened the movie with a nice introduction and closed it with a Q&A. As a gay Canadian with South Asian roots, I find that international films tend to stereotype immigrant parents as stern and judgemental, which wasn’t the case for me growing up. It was refreshing that while Zaynab’s mother was traditional in her views, her love for her daughter was apparent along with her intent for her happiness. 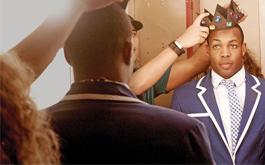 YouTube sensation and American Idol contestant Todrick Hall steps up his game as he writes his first album, also choreographed into a touring original musical, Straight Outta Oz. This documentary follows the challenges and hurdles that this gay, coloured entertainer has encountered from his childhood growing up in Texas to the effects of current hate crimes going on in the US based on race and sexual orientation. Hall brings the audience into the personal lives of his entourage and himself as we see his creativity come to life as the musical is fine-tuned and then delivered for the first time on opening night. Despite any roadblocks that happen along this glitter-lined journey, the cast remains united in support of Hall’s vision. The cinematography had a modern feel which will resonate well with aspiring artists looking for inspiration. The snippets of the performances cut quickly with the interviews kept the documentary from dragging, as well as using the tour locations as a road map for the plot was clever. The documentary deals with heavy themes of race, gender, and sexuality, but is complemented nicely with acceptance and perseverance. It left the audience feeling inspired in the theatre, which was a nice way to end the weekend.